My first project of the year is done, and it wasn’t even planned! I started work on the red/white regency dress (an update will follow soon), and while I was working I noticed the fabric was a bit sheer. No problem of course, that’s perfectly period, but it does require a petticoat beneath the dress. But that wasn’t exactly my plan, as I believe it was reserved for the very fashionable, and mainly worn in France. 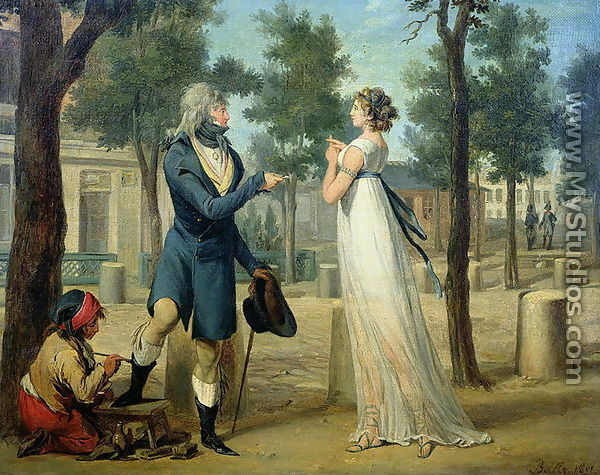 (Also, in the image above the man is trying to pay the lady as he supposes she’s a prostitute because of her clothes, she’s making the cross to ward him off). 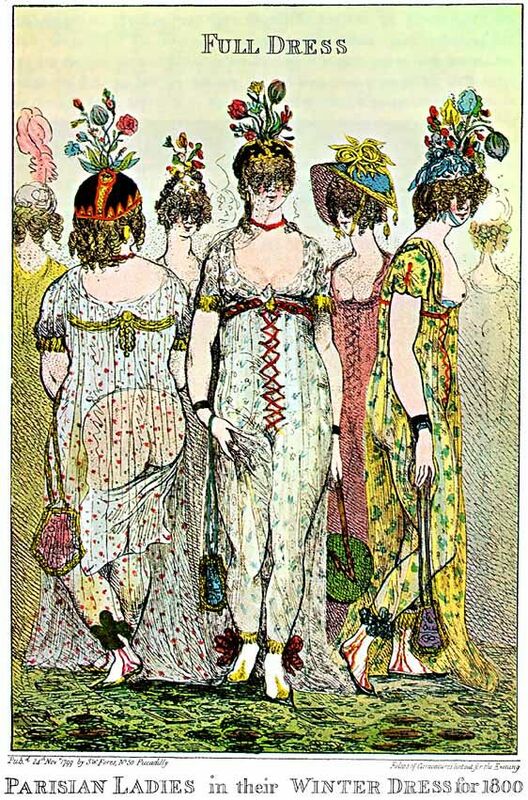 I also had some fun looking at the caricatures of sheer dresses at the time. It definitely wasn’t for everyone. Anyway, a petticoat it was! 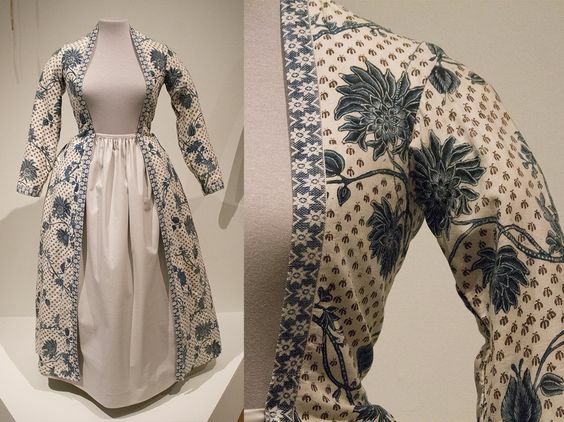 I’d originally bought cotton to line the dress, but afterwards found that generally, only the bodice of Regency dresses are lined and not the skirts. So there was plenty of fabric left to make a petticoat. 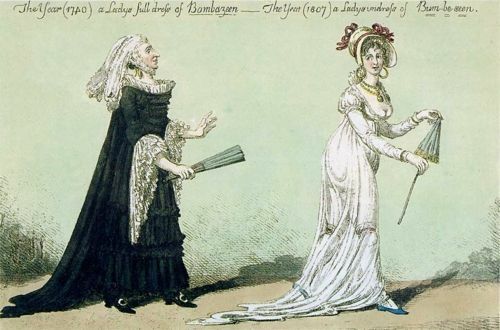 Generally speaking, there’s two types of petticoats, namely those with bodice and those without. The petticoats without bodice usually do have straps, to keep the skirt up at the empire waistline. I opted for the straps option, mostly because it was easiest. I made up the petticoat very quickly, and without any decoration, as it’s mostly so I can wear my dress when finished. It’s basically just a skirt pattern with some bias tape finishing the top, a slit in the side and 2 straps. I don’t know how accurate this construction is, but it works! As it’s so simple, I drew out the pattern I used for this. I made it to scale, if you click on it you should get the full scale version. 100 pixels is 10 cm. Some notes: My ’empire-waist circumference’ (under-bust measure) is about 75 cm, so the back panel ‘gathered to fit’ in this case means gathered to 75-55=20 cm. If you have a different circumference, you might want to scale up the width in both pattern pieces. The 110 cm in height is also for me, I’d strongly suggest measuring yourself for the height. Measure from your empire waist to where you want your petticoat to hang. 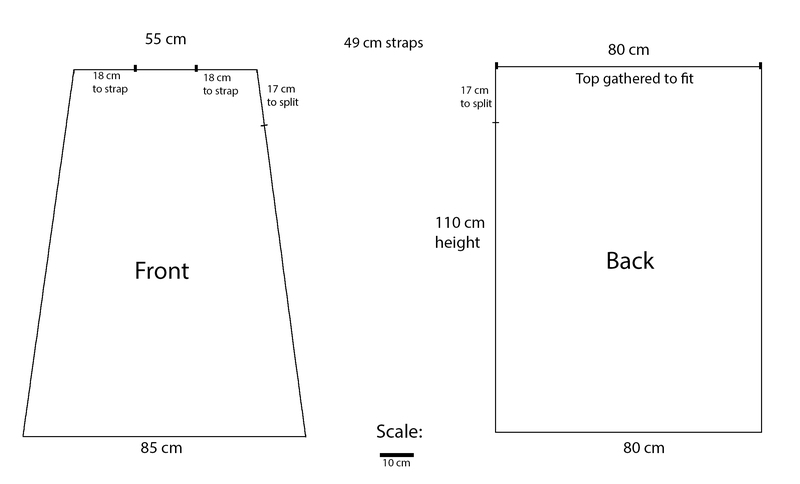 I also put in 110 cm both for the front and back panel, but I suggest cutting the back slightly higher than the front, as you’ll be attatching the straight back side seam to a tilted front side seam which will be longer. I did this, and just cut off the exces after attaching the panels. For the straps, the length is also based on me, and I suspect will be different for everyone. 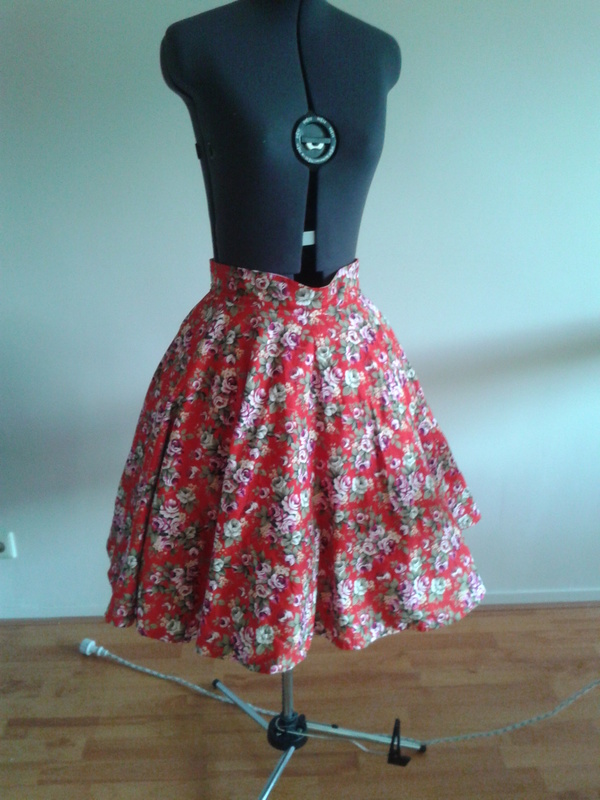 Just put the petticoat on you, pin the straps to the back at the side of the panel and check the length in the front. The same goes for the position of the straps in the front. This depends on your empire waist circumference and cup-size probably. And, just in case, always fit over your stays! This way you can also check the placement of the straps to make sure they won’t show with a gown with a wide neckline. Finally, there’s no seam allowance in this pattern. I used the selvedge as hem and bias binding at the top, so I didn’t need an allowance at either. If you’re hemming the top and/or bottom, don’t forget to add this. Same goes for the side-seams. I measured the pattern after sewing, so no allowance included. Good luck! 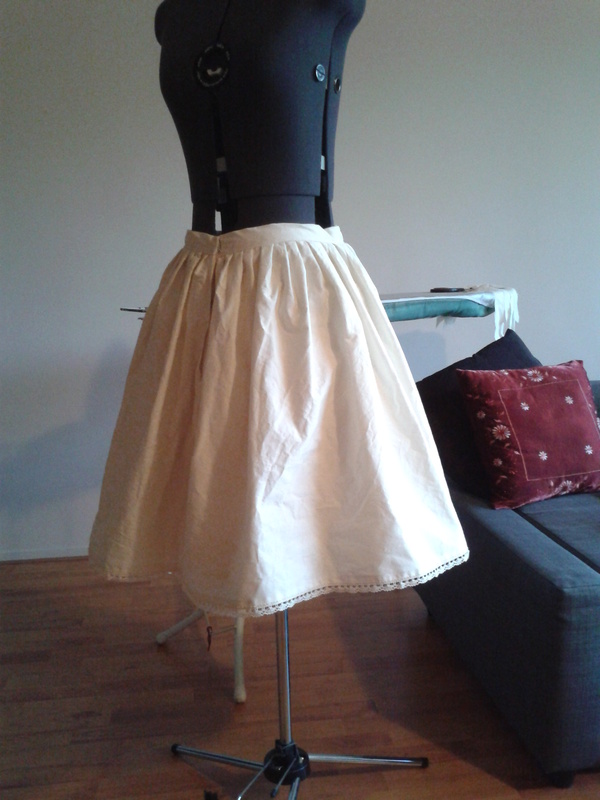 I’ve been wanting to make a cotton petticoat for under my knee-length skirts for a while. My good petticoat is an A-line, but I have some skirts for which a bell-shape is more appropriate and I like the idea of cotton for petticoats. I’d been looking out for a pattern for a while, because I wanted to get the shape and volume right. Recently, I had a performance with my dance group doing an hungarian piece and got to have a look at the petticoats worn with the costume. I’m not certain if these petticoats are also the traditional type worn, but they certainly give the bell shape. 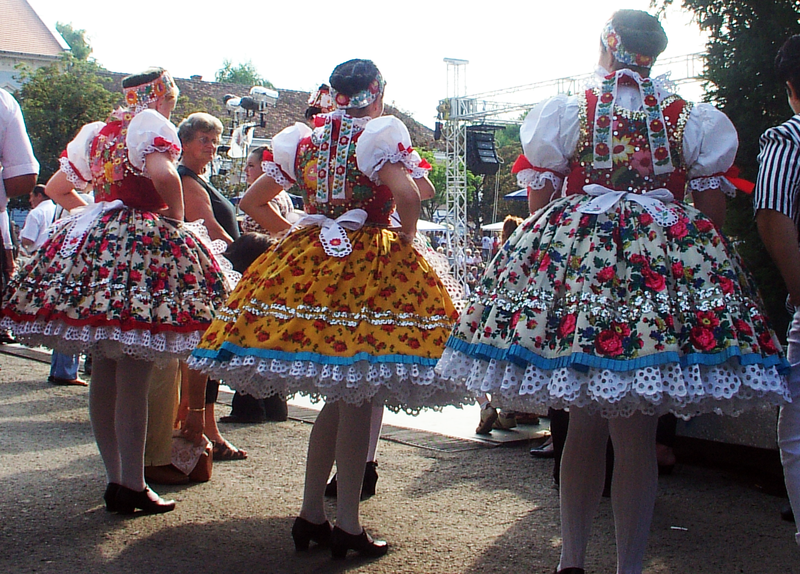 Voivodina Hungarians (Kupusina and Doroslovo) women’s national costume. I figured I’d share my pattern with you. The petticoat consist of 3 layers, a top layer and two under-layers. These layers, together with pleats and gathers give the volume. For this pattern you need to decide on 2 things on your own, namely your waist circumference and the length you want the petticoat to be. Start with making a waistband for yourself, fitting at the natural waist. Decide on whatever closure you want in the waistband, can be hooks, a button, or another type of clasp (sew this on at the end). My pattern closes only at the waistband, leaving a slit open in the skirt. This doesn’t matter as it’s a petticoat and therefore always worn under another skirt. If you wish to wear it as an over-skirt, make sure that the slit fully closes or insert a zipper. So the width will be your waist measurement times 3, the height will be the length you want the petticoat to be. Beware that if the petticoat is very full, the actual length might fall a bit shorter because the skirt stands out from the body. In this case, add a little to your desired length to get the height measure. This top layer is pleated onto a waistband at the top. 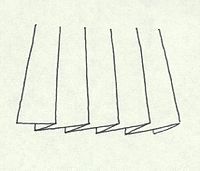 Make sure your pleats meet, in that you have 3 layers of fabric everywhere. 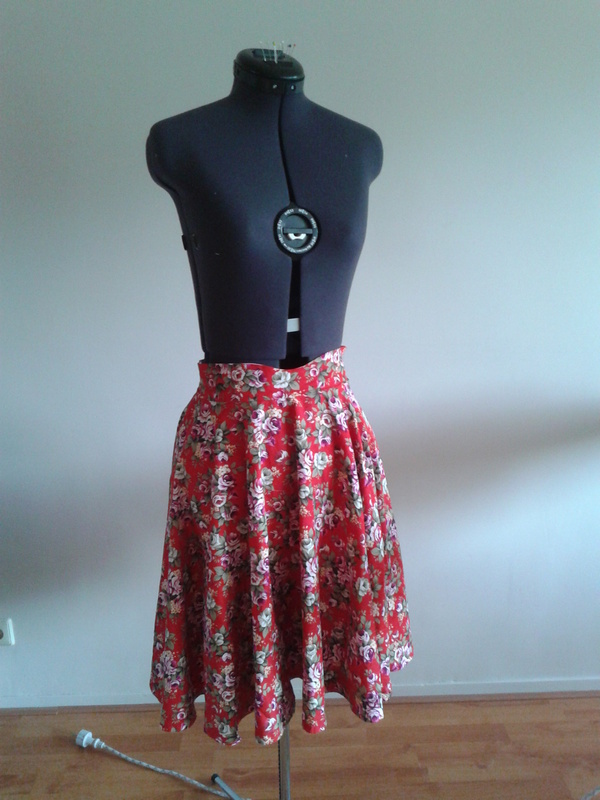 I used 1,5 cm pleats, but you can look at what you like visually. I’d recommend smaller pleats though. Sew the sides together, leaving a slit at the top which your hips fit through. Hem the slit. 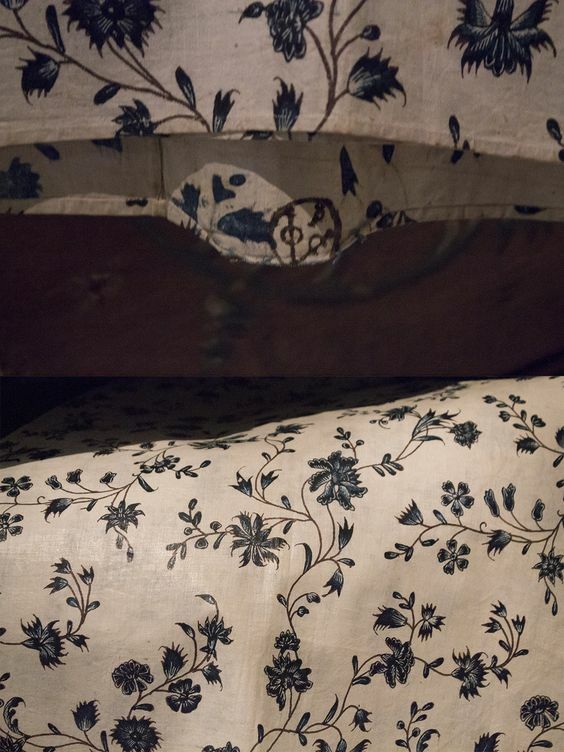 The bottom two layers of the petticoat only have fullness at the bottom. This is the pattern for the top part of the lower layers. You’ll need to cut this out 4 times. I recommend making a mock-up first, as this part is more close fitted. The lower measurement is your hip circumference at a point Length/2 below your waist. If your petticoat length is 40 cm, measure at 20 cm below your waist, if it’s 70 cm, measure at 35 below your waist. Be careful if you measure below the widest part of your hips, in this case just take the full hip measure at the widest part. You can add a little ease to the bottom part of this pattern to make sure it’s not too snug. How much can be up to you, but I’d say that 10 to 20 cm is safe. Once this is cut, sew 2 of the pieces together at one side. Sew the other side close at the bottom leaving a slit at the top. Make sure you can fit it over your hips when deciding how deep the slit is. Hem the edges of fabric at the slit. In other words, the height is again half the length you want, so your bottom layers will be the same length as your top layer. 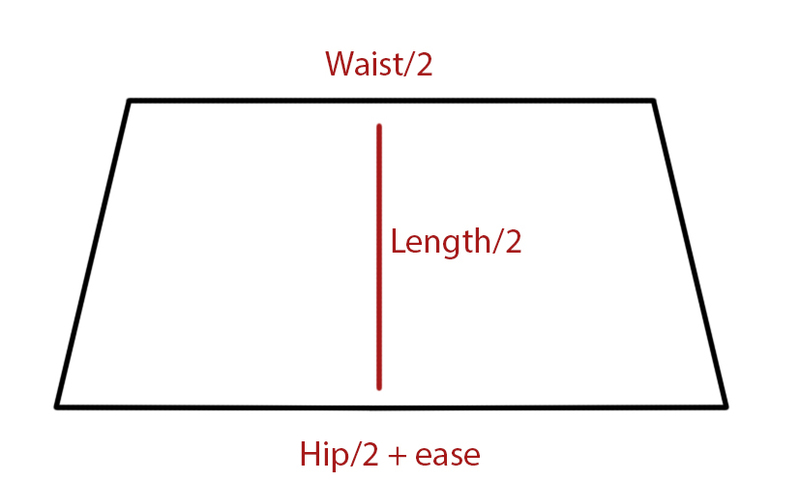 The width is based on the bottom length of the top part of the under layer (Hip/2 + ease measurement). For this, take your hip measurement + ease as a base. (Not divided by 2, as now you’re looking at the full hip measurement and not half of it). You can take this measurement and multiply it by a number somewhere between 2 and 3. This decides how full the bottom of your petticoat will be. For a very full one at the bottom, pick a higher number. If you go above 3, it might be a bit hard to gather everything. Gather the top of this piece of fabric, and sew it onto the bottom of the top part of the under-layer. Final step: hem everything (it’s prettiest if the under-layers don’t show, so make the hem of the upper layer slightly narrower). Trim if you want. Done! You can barely see the pintucks in this photo, but you can see that ik gives even more of a bell-shape with the skirt a bit shorter. The hem. I trimmed it with cotton lace. It’s not antique, but made with a still operating antique cotton machine. The two pintucks are 1 cm each and placed 4,5 and 8 cm above the hem. The first bottom layer. There is one more like this beneath. These layers also have 2 pintucks in the same way as the top layer, but no lace. This looks a bit weird, but I just pinned the top two layers up so you can see there’s a 3rd one. And the petticoat with a skirt on top, to show the volume. And for reference, the same skirt without petticoat.